Following the post earlier in the week about the return of James Arnold Taylor (voice of Obi-Wan Kenobi – Star Wars: The Clone Wars) and Ashley Eckstein (voice of Ahsoka Tano – Star Wars: The Clone Wars) as Celebrity Hosts for Star Wars Weekends, we received a new transmission from an R2 unit that reveals more Star Wars celebrities scheduled to appear this year at Disney’s Hollywood Studios park. The annual event takes place each Friday, Saturday and Sunday from May 18-June 10, 2012. With Donald Duck doing his best Darth Maul impression in the 2012 event logo, seen here, Star Wars Weekends 2012 will welcome several celebrities from Star Wars: Episode I The Phantom Menace for the Force-filled fun. 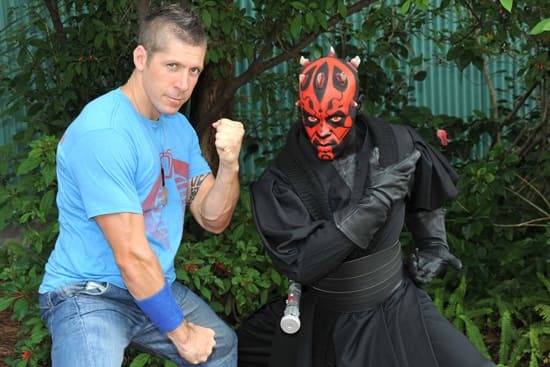 In fact, Donald will have the chance to meet Ray Park, the action star who portrayed Darth Maul, during an extended engagement. Ray (pictured below) is scheduled to appear in both Weekends I and II. Another 2012 highlight: keep a sharp eye during Weekend IV when bounty hunters — a favorite among many fans — take center stage in their very own weekend (doesn’t that seem appropriate, considering Star Wars bounty hunters generally work on their own anyway?). As an added surprise, Weekend IV will be a “Bonus Boba” weekend! Both actors who portrayed laconic enforcer Boba Fett in the saga — Jeremy Bulloch and Daniel Logan — will appear during the event’s closing weekend. Each weekend will also feature a visiting celebrity voice actor from the popular animated TV series, Star Wars: The Clone Wars. “Hyperspace Hoopla”: This high-energy, one-of-a-kind show is a chance to see some of the famed Star Wars characters performing like never before. It will take place on a stage in front of the Sorcerer Mickey hat on Hollywood Blvd., and is scheduled to begin at 8 p.m. each event evening. Star-Studded Event: Keep in mind, autograph opportunities are not the only place to see the celebrities. Star Wars stars take part in fun throughout the day in Star Wars-themed talk shows, behind-the-scenes presentations, the gala “Legends of the Force” parade and more. That’s the latest for now. Keep checking back as we confirm more scheduled activities for Star Wars Weekends 2012. Do you have any special memories of past Star Wars Weekends or of any of the celebrities that will attend this year? If so, please share in the comments. This will be my boyfriend first time going to Star Wars and all I want to know is…Will we be able to take pictures with them? any news on pins or other merchandise? can you please advise when the merchandise lists for star wars weekend will be released? would like to know what cool items are available?? Sweet! Bounty Hunters the weekend we’ll be there! My son is a HUGE Boba Fett fan! He’ll be excited! Erik, based on previous years celebrities will have a black and white disney branded 5×7. Most will allow you to have one of those or something you bring. Some will allow you to bring something and have the 5×7 signed. Make sure you get to the park very early to get in the fastpass line for autographs. They go quickly. Great to hear Ray Park will be there when we’re there opening weekend!! Kinda bummed that Anthony Daniels won’t make it? Any idea why?? This will be our first SWW, and we’re pumped. Will there be pics there for the celeb signing, or should we be prepared to bring something with us? 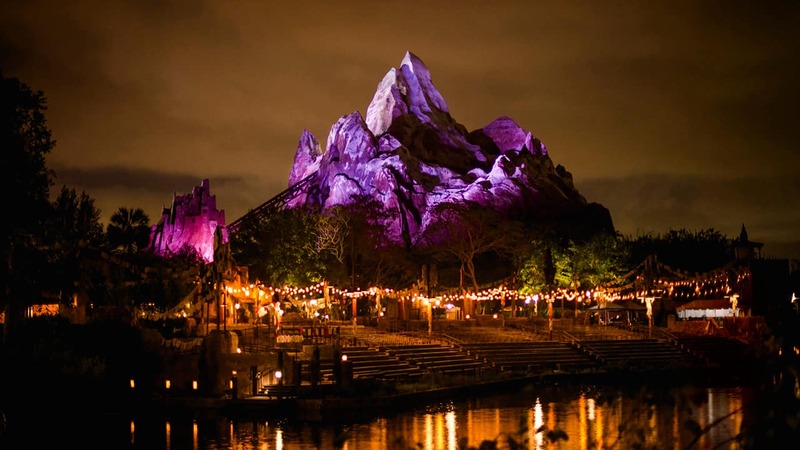 Complimentary 5×7 photo cards will be provided to FASTPASS holders waiting in the celebrity autograph lines. Awww.. I wish Dave Filoni is going, but apparently not :(. It looks like fun though. I will be able to make it for weekend IV! Ventress and Fett! Boo yah! Wish I could make weekend IV, but will be there for weekend II! So sad that Ray Park will not be there the 3rd or the 4th weekend!! In 2010 and 2011 he was there the 3rd and 4th weekend so we planned our trip around that. Still super excited but would have loved to meet him!! !